Questo semestre, abbiamo cinque tavole italiane fantastiche! Ci incontriamo ad una tavola in Upper Usdan e parliamo in italiano– un modo molto divertente per praticare!Note: each table lasts an hour as listed, but you can also stop by for just a few minutes. 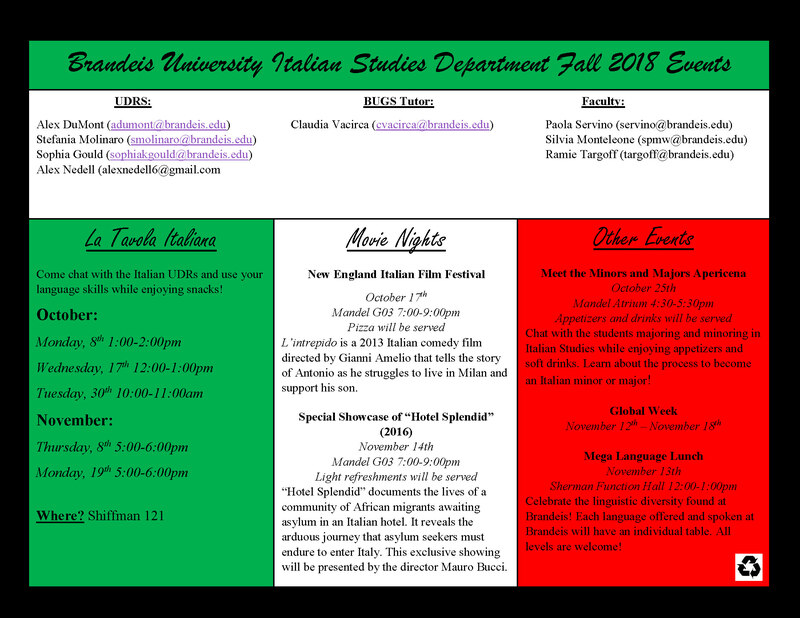 Event reminders, updates, songs, articles, recipes, and more can be found on the Italian Studies Facebook Page. The next Tavola Italiana will be Wednesday, October 17th from 12:00pm-1:00pm in Shiffman 121. We will be playing Italian card games and drinking espresso! Extra-Credit is given to those who come. For more information, see the event flyer with all the important dates for the Italian Department!